Like the American Journal of Science, this journal came to life at the behest of its original editor (and publisher), Thomas P. Jones. Jones worked at the Franklin Institute but, by volume 5, had become the Superintendent of the (US) Patent Office. 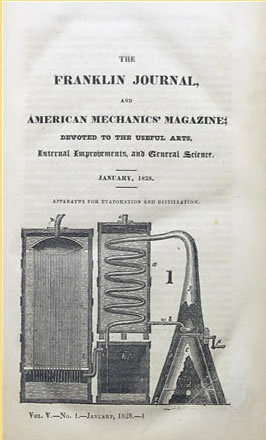 The original title was American Mechanics' Magazine and Jones himself paid for the printing of the first four volumes. He reportedly did not quite recoup his expenses before he relinquished the journal to the Institute, but felt it was all for a worthy cause. It was not unusual in that period for a single individual (or small group) to edit and publish a journal while maintaining a full professional life as well. The full title was the Journal of the Franklin Institute and the American Mechanics Magazine,which gives a good picture of the content. Much of it was patent summaries for the United States and elsewhere. Interspersed in the issues were reports from scientists, musings on technology, and original research. The Journal continues today with a narrower and more scholarly focus on engineering mathematics.